William Boulton Ltd. is a British engineering company based in Stoke-on-Trent which was originally founded in 1852. 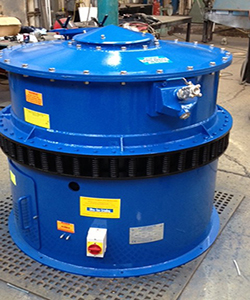 Our speciality is in the design and manufacture of vibratory process plant and machinery. Only the Boulton design of Vibro-Energy® Grinding Mill has the vibratory generator mounted at the centre of gravity of the mill chamber with the coil springs mounted around the periphery of the chamber. Narrow Particle Size Distribution of Products. Easy to Install with Minimal Maintenance Time & Costs. Low Power Consumption & Noise Levels. All Mills are designed to be readily convertible from Batch to Continuous and vice versa. 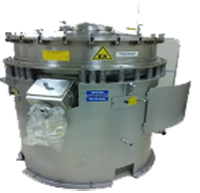 This design produces maximum ultra fine grinding efficiency compared to our old, low amplitude, original design with the vibratory generator and springs mounted below the chamber. Boulton Vibro-Energy® Grinding Mills offer versatile, low cost, controlled particle size reduction with minimal wear and product contamination. No other type of mill has so few mechanical moving parts. 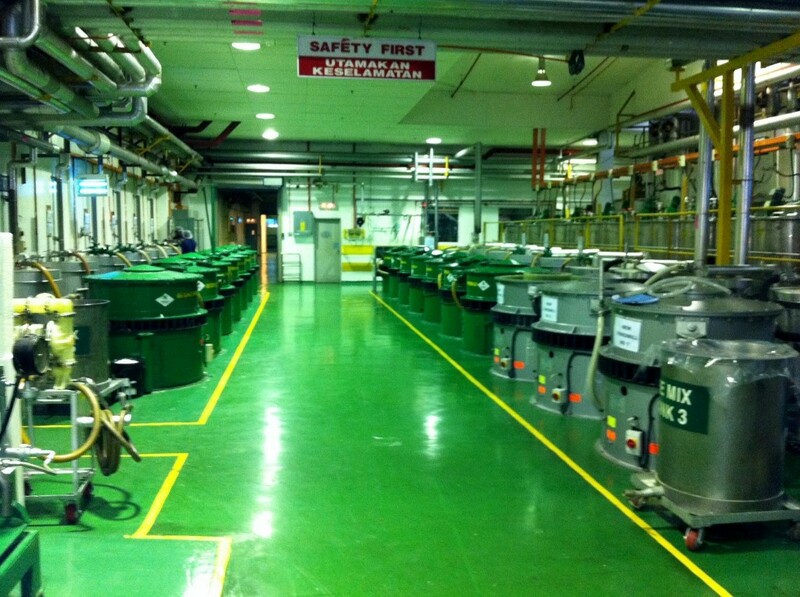 Power consumption is low as there are no rotating impellors or drums. The mills utilize inert high density sintered ceramic or carbide grinding media for iron-free grinding. The media is cylindrical or ball shape and is subjected to a high frequency, high amplitude vibration producing a vibrating and tumbling vortex action within the annular shaped grinding chamber. The process material fills the void spaces within the media mass. It is well-known that the commercial value and performance of many materials is vastly increased by Ultra-Fine Grinding and the Vibro-Energy Grinding Mill is a proven machine for obtaining such materials with high efficiency and at low cost. Grinding is carried out in the Mill by the use of high density Ceramic Media. The requirements for ultrafine grinding are that relatively small forces need to be applied at very high frequencies to thin layers of the process material. Not only is it unnecessary to apply large forces in fine grinding but it is undesirable, since these would damage the grinding media and the grinding mill lining, resulting in considerable product contamination. The grinding forces must be applied to thin layers of material otherwise energy is expended in re-arranging the particles without producing breakage. The easiest method of ensuring thin layers of process material is to distribute it throughout a large contact area within a close packed mass. The mode of vibration of the Vibro-Energy Grinding Mill is tailored to ensure close packing of the media. Cylinders are the usual grinding media since they will provide more contact area than any other easily manufactured shape. Cylinders can be shown to possess the further advantage in that since only line and plane contact is possible, they will grind coarse material preferentially, see Figure 1. Thus, milled products will usually have a narrower particle size distribution than products from other mills and in most industries this can be of vital importance. The standard grinding media for the use in the Grinding Mill chamber consists of High Density sintered Alumina or Zirconium cylinders. Other Types of media are used where appropriate. 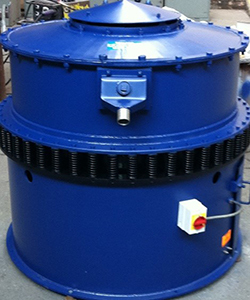 The Grinding Mill chamber is lined with Resistant Rubber or Polyurethane. Carbon or Stainless Steel Grinding chambers are available. The Mills can also be operated under Vacuum or Pressure. 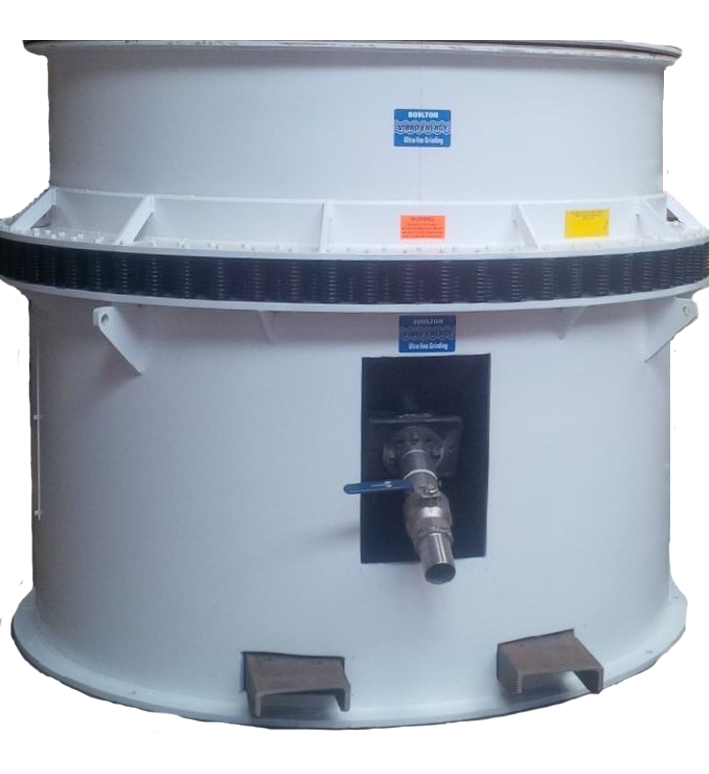 The grinding action of the Vibro-Energy Mill is generated by the annular shaped grinding chamber imparting a high frequency, High, Medium & Low amplitude vibration to the grinding media. The material to be ground fills the interstices between the grinding media. Chamber movement is in turn generated by a specially designed double ended electric motor having out of balance weights. Springs at the periphery of the grinding chamber provide a restoring force and also substantially damp out vibration to the mill base. Only very small forces are required for ultra-fine particle size reduction and these are produced as the pieces of grinding media impact against each other. The pieces also tend to spin, creating a certain amount of shear force but more important in ultra-fine grinding, ensuring that a truly cylindrical surface is maintained. 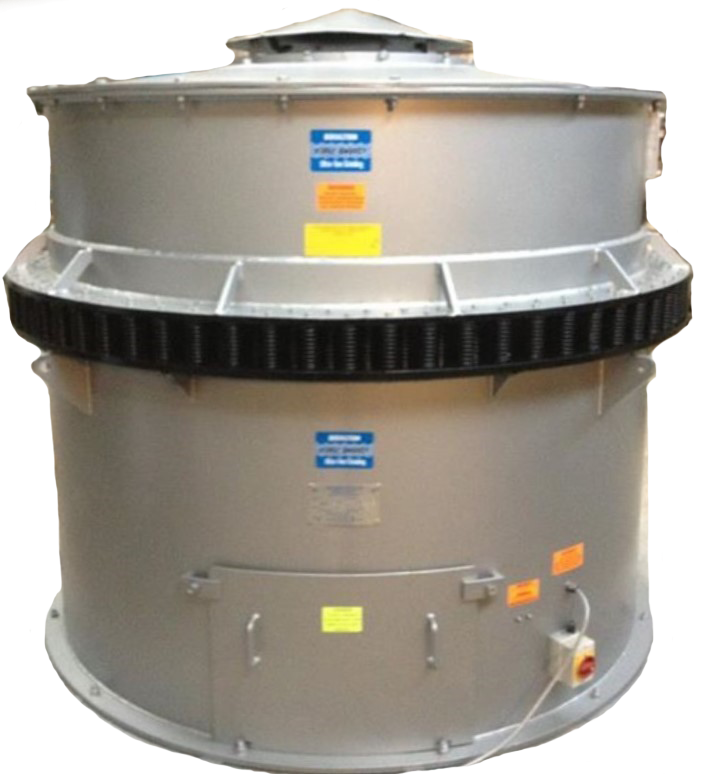 The design of the William Boulton Vibro-Energy Grinding Mill ensures the correct relationship between centre of gravity balance and the mode of vibration which causes the media to close pack. The packed mass of media slowly gyrates in the horizontal plane while in the vertical plane it rises in proximity to the outer wall and descends as it approaches the inner wall of the chamber, see Figure 2. 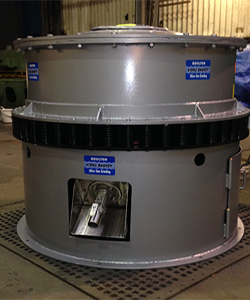 The motion assists in distributing the charge and the wet grinding mill helps maintain the solids in suspension. The degree of motion is readily controlled by varying the position of the out of balance weights on the motor shaft. Low Maintenance & Running Costs. 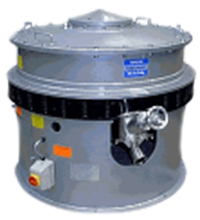 Due to the relatively small forces required for ultra-fine particle reduction the wear rate of the grinding media and chamber lining is kept to a minimum in. Contamination of the product is therefore negligible as, for example, the whitest of materials can be processed without discolouration from the standard rubber lining. A Vibro-Energy Grinding Mill (Type AM100) containing 5 tonnes of High Density Alumina media wears at 0.0017% per hour when grinding Zircon Sand – one of the hardest minerals used in the ceramic industry. This represents 0.04% loss per tonne of ultra-fine Zircon Sand produced. The largest Grinding Mill uses only a 15kW motor and mechanical parts requiring maintenance are just the motor bearings and support springs. The result is that the Vibro-Energy Mill gives many years of maintenance-free continuous running 24 hours per day, lubrication being the only attention necessary. Ceramic: Raw Materials for Body and Glaze. A closely-controlled particle size distribution is extremely valuable in the production of slips and glazes the Boulton grinding mill reaches a reduced particle size that ball milling cannot reach. Grinding time cycles are reduced leading to less energy consumption compared to Ball Milling. The Vibro Energy Mill is especially suitable for grinding porcelain enamel powder. Advantages include the ability to produce a product that will give maximum opacity and smoothness without producing excessive fines. Elimination of oversize particles and uniformity of distribution contribute to higher quality in the end product. In the these industries where media wear and chemical reaction is a problem, the use of Grinding Mills provide extended media, chamber lining life and subsequent savings. The ability to grind particles under 10 microns is of particular importance in the development of new artificial abrasives. In conjunction with cylindrical shaped grinding media the close packed mass preferentially reduces larger particles due to the media line and plane contact surfaces, producing milled materials with a narrow particle size band distribution. All mills are adjustable for low amplitude operation if required. Mill contact parts are either cast polyurethane at hardness 85-90 Shore “A”, vulcanised rubber or steel. William Boulton Grinding Mill – Type AM25 & AH25 – Medium & High Amplitude – Latex, Abrasive & Chemical Industry. William Boulton Grinding Mill Type AM100 & AH70– Medium & High Amplitude . 8HP & 12HP Motors. Product Material Application :Chromium, Aluminum powders, Niobium, Ferro titanium, Boron, Polishing powders & Welding powders. Click here to see just some Materials that our Grinding Mills are used for in Particle Reduction (Ultra-Fine Grinding).